Originally published under the title, "How Non-Muslims "Survive" in Turkey." Prominent non-Muslims in Turkey, then and now. Left: an Ottoman Janissary officer. Right: the Armenian Christian intellectual Etyen Mahcupyan, who retired as advisor to Turkey's prime minister after saying "what happened to Armenians in 1915" was "genocide." Last October, Etyen Mahcupyan, a leading Turkish Armenian intellectual, "liberal" writer and columnist, was appointed as "chief advisor" to Turkey's Prime Minister, Ahmet Davutoglu. At first glance, this was good news in a country where Islamists privately adhere to the old Ottoman millet system, in which non-Muslims were treated as second-class (if not third-class) citizens. In reality, Mahcupyan was a reincarnation of the Ottoman "devshirme" system, in which the Ottoman state machinery produced several non-Muslim converts who enjoyed a place in the higher echelons of the palace bureaucracy, and the finer things of life, because their pragmatism earned them excellent relations with the ruling Muslim elite. In a December interview with Turkey's leading daily, Hurriyet, Mahcupyan said, "Whatever has been a [political] asset for Turkey's Armenian community (they number around 60,000) is an asset for the Jewish community too. But... there is Israel... As long as the psychology of the Israel issue continues to influence politics in Turkey and relations between the two countries do not normalize..." The line, which Mahcupyan shyly did not finish, probably would have gone on like this: "Turkey's Jews will keep on paying the price." Mahcupyan admitted that if Turkey's Jews felt alienated, it was the government's responsibility to do something about that. What more? "I have lived through this personally for the past 60 years," he explained. "Among Turkey's non-Muslim minorities, including Jews and Armenians, there is an opinion about humiliating Muslims." As Mahcupyan's statement is not true, it therefore just seems a way to justify Islamists' intimidation of Jews. Next, Mahcupyan argued, "Both Jews and Armenians are better-educated [than Muslim Turks] and more open to the West. And this brings in a feeling of superiority complex." In this view, daily attacks on Turkey's Jews and other non-Muslims happen because Jews and Armenians humiliate Muslims -- they are better-educated than Muslims and hence their superiority complex. The charge is, at best, silly. As in Ottoman times, just one unpleasant utterance can suffice to end a devshirme's career in government service. Only a few months later, Mahcupyan would learn how wrong he was about the Islamist supremacists in Ankara and their inherent intolerance to liberal thinking. Mahcupyan recently commented on Pope Francis's remarks on April 12, in which the Pope described 1915 as "the first genocide of the 20th century," and said that the Vatican had "thrown off a 100-year-old psychological burden." If, Mahcupyan said, accepting that what happened in Bosnia and Africa were genocides, "it is impossible not to call what happened to Armenians in 1915 genocide, too." It was probably the first time in Turkish history that a senior government official recognized the Armenian genocide. Once again, at first glance, that was good news in a country where outright denial has been the persistent official policy. But it seems Turkey was not quite as liberal as Mahcupyan had thought. Immediately after his remarks became public, EU Minister Volkan Bozkir expressed unease, saying that "Mahcupyan's description was not appropriate for his title of adviser." But that was not the only price Mahcupyan would have to pay. A few days after his remarks on genocide, Mahcupyan "retired" as chief adviser to Prime Minister Davutoglu -- after only about six months in the job. Officially, Mahcupyan had retired in March after turning 65, the mandatory retirement age for civil servants. But it was an open secret in Ankara that his departure came simply because Turkey's Islamists were not quite the liberals he had claimed they were. 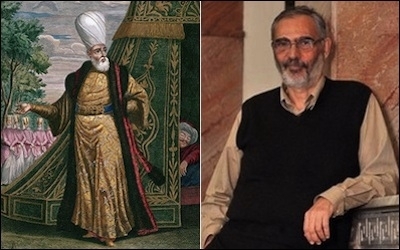 The "Mahcupyan affair" has a message to Turkey's dwindling non-Muslim minorities: Just like an Ottoman devshirme, a non-Muslim can rise and become a darling of today's neo-Ottoman Turks. He can win hearts and minds in important offices in Ankara -- and a bright career. But to maintain his fortunes he must remain loyal to the official Islamist line, both in deed and rhetoric. Just one unpleasant utterance would suffice to end a devshirme's career in government service. There is another Turkish Armenian columnist who looks more seasoned than Mahcupyan in his devshirme career. Markar Esayan, a writer for a fiercely pro-government daily, recently said in reference to President Recep Tayyip Erdogan's 2014 statement about the Armenian victims of 1915: "[Erdogan's] message of condolences illustrates how we have achieved the Ottoman spirit in line with this century and its democratic practice. Furthermore, the practices in the last 13 years [of the Justice and Development Party's rule] have positively influenced our [Armenian] community and non-Muslims." Apparently Esayan is happy with Turkey's neo-Ottomans and their Islamist rule, including their rigid policies of genocide-denial, which he claims have done good to Turkey's Armenians and other non-Muslim citizens. Etyen Mahcupyan may have been punished, but Markar Esayan is being rewarded for his loyalty: he has been selected to run for parliament on the ticket of Prime Minister Davutoglu's party!